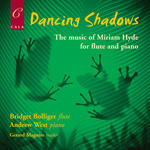 Dancing shadows : for flute and piano / by Miriam Hyde. Difficulty: Medium — Flute grade 5/6 , piano grade 6. 1 Aug 2016: at Concert Conversations with Piers Lane 2 (Townsville Civic Theatre). Featuring Bridget Bolliger, Andrew West.